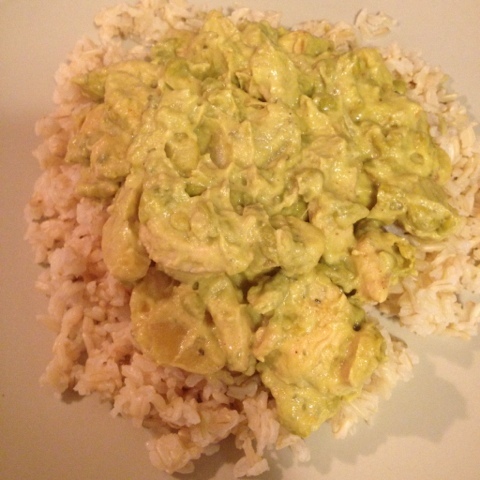 Here I made green curry chicken with brown rice. 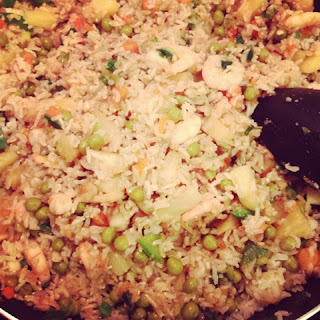 I rarely eat rice but I try to eat brown rice when I do. This picture doesn't do justice to how good it was! I used green curry spice with coconut milk instead of the ready store bought sauce because it tastes much better. I added more veggies than the recipe calls for. 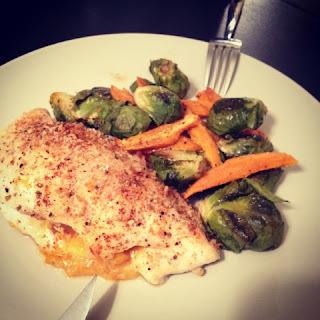 Here I made broccoli, cheese, roasted red peppers and salsa stuffed chicken breasts with Brussels sprouts and sweet potato fries. I never liked sweet potatoes before but recently I've gained a taste for them and they are a great super food containing vitamins, iron and magnesium. Amazing chicken shawerma made by the one and only Riham. 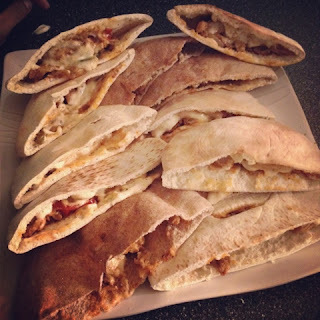 We both ate ours in wheat pita pockets while everyone else had white. Here comes the not so healthy foods. 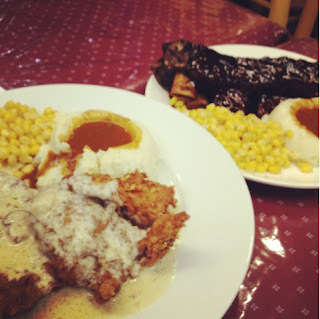 This was fried chicken in mushroom gravy and lamb ribs in bbq sauce from RJ cafe in Beltsville, MD. This was my first time trying this amazing halal place. The portions were big so we all shared which was good so I didn't over eat. I did go home and go straight to the gym though! 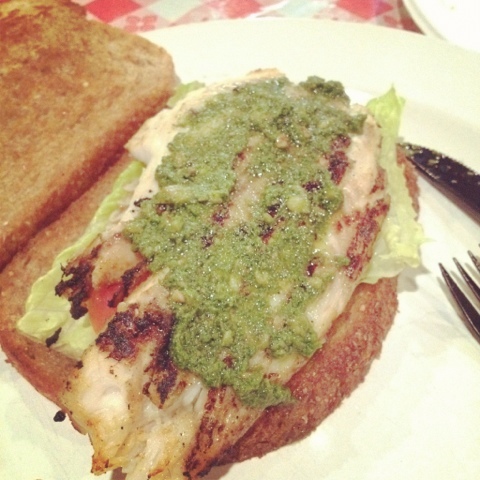 This was a pesto walnut tilapia sandwich from Tackle Box in DC. It was my first time going there and this sandwich was amazing! I didn't know what to expect but now I know next time to tell them not to butter the bread. 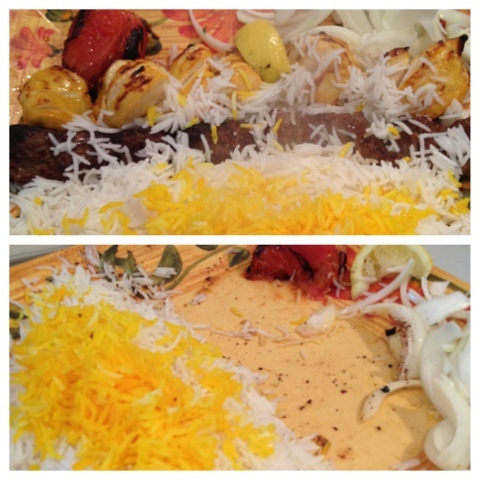 Here is my plate from Shamshiry, my family's favorite Persian restaurant in VA. I got the soltani which has one skewer of boneless chicken and one skewer kabob and it comes with rice. They give bread on the side so I eat the meat with bread. As you can see my rice was untouched. Their portions are so big I usually only eat half of each skewer and take the rest home. Here is a snack I took to work. 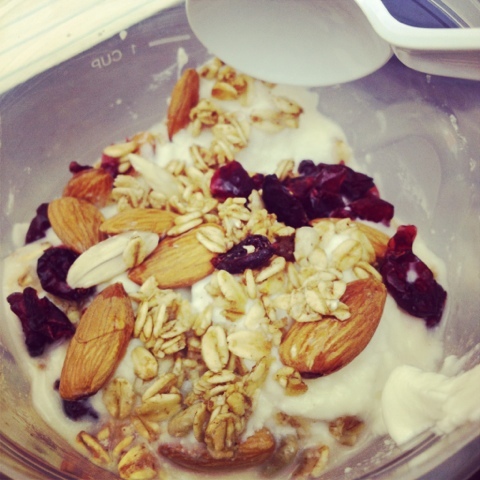 1 Cup plain greek yogurt with honey, almonds, oats, flax and craisins. My indulgence: Home made double chocolate swirl chips cookies. Needless to say, my stomach has been quite satisfied. Always remember you shouldn't deprive yourself of the foods you like, just maintain portion control and be conscious of what you are eating. If I know I'm going to eat out for dinner, I'll eat lighter throughout the day. 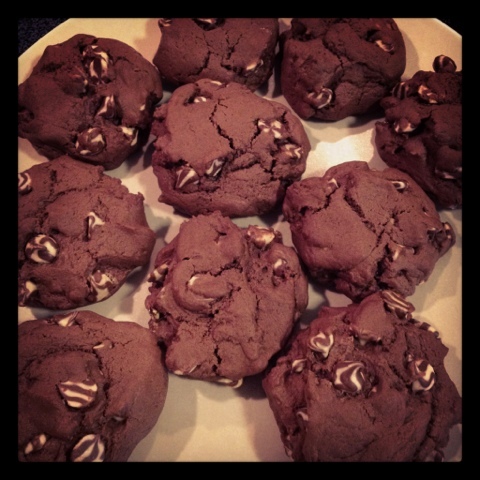 Skinny Taste is a great website to use for healthy recipes that still taste great. I like to use recipes from this website and add my own twist which makes cooking more fun. InshaAllah (God Willing), I'll do an outfit post later today!